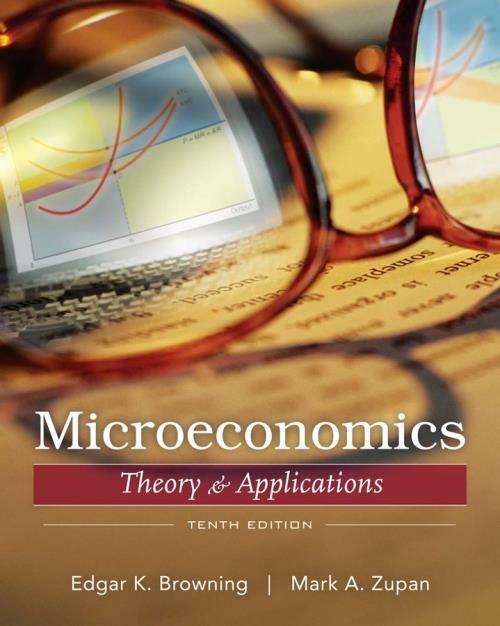 The 10th edition of Browning and Zupan's Microeconomics: Theory and Applications continues to motivate students and introduce them to current thinking in the field. This book appeals to students and instructors alike because of its accessibility, large number of applications, and the clear step-by-step manner in which graphs are introduced. In this new edition, the authors have included more applications and more mathematical material to reinforce students’ understanding of basic microeconomic principles. This knowledge of microeconomic theory will serve as an essential foundation for any business major or for those preparing for a future career as a business professional. Chapter 1: An Introduction to Microeconomics. 1.1 The Scope of Microeconomic Theory. 1.2 The Nature and Role of Theory. 1.3 Positive Versus Normative Analysis. 1.4 Market Analysis and Real Versus Normal Prices. 1.5 Basic Assumptions about Market Participants. Chapter 2: Supply and Demand. 2.1 Demand and Supply Curves. 2.2 Determination of Equilibrium Price and Quantity. 2.3 Adjustment to Changes in Demand or Supply. 2.4 Government Intervention in Markets: Price Controls. 2.6 The Mathematics Associated with Elasticities. Chapter 3: The Theory of Consumer Choice. 3.4 Changes in Income and Consumption Choices. 3.6 The Utility Approach to Consumer Choice. 3.7 The Mathematics Behind Consumer Choice. Chapter 4: Individual and Market Demand. 4.1 Price Changes and Consumption Choices. 4.2 Income Substitution Effects of a Price Change. 4.3 Income and Substitution Effects: Inferior Goods. 4.4 From Individual to Market Demand. 4.6 Price Elasticity and the Price-Consumption Curve. 4.8 The Basics of Demand Estimation. 4.9 Deriving the Consumer’s Demand Curve Mathematically. Chapter 5: Using Consumer Choice Theory. 5.1 Excise Subsidies, Health Care, and Consumer Welfare. 5.2 Public Schools and the Voucher Proposal. 5.4 The Consumer's Choice to Save or Borrow. Chapter 6: Exchange, Efficiency, and Prices. 6.2 Efficiency in the Distribution of Goods. 6.3 Competitive Equilibrium and Efficient Distribution. 6.4 Price and Nonprice Rationing and Efficiency. 6.5 Some of the Mathematics behind Efficiency in Exchange. 7.1 Relating Output to Inputs. 7.2 Production When Only One Input is Variable: The Short Run. 7.3 Production When All Inputs are Variable: The Long Run. 7.5 Functional Forms and Empirical Estimation of Production Functions. 7.6 The Mathematics behind Production Theory. Chapter 8: The Cost of Production. 8.1 The Nature of Cost. 8.2 Short-Run Cost of Production. 8.4 Long-Run Cost of Production. 8.5 Input Price Changes and Cost Curves. 8.8 Importance of Cost Curves to Market Structure. 8.9 Using Cost Curves: Controlling Pollution. 8.12 The Mathematics behind Production Cost. Chapter 9: Profit Maximization in Perfectly Competitive Markets. 9.1 The Assumptions of Perfect Competition. 9.3 The Demand Curve Facing the Competitive Firm. 9.5 The Perfectly Competitive Firm's Short-Run Supply Curve. 9.6 The Short-Run Industry Supply Curve. 9.8 The Long-Run Industry Supply Curve. 9.9 When Does the Competitive Model Apply? 9.10 The Mathematics Behind Perfect Competition. Chapter 10: Using the Competitive Model. 10.1 The Evaluation of Gains and Losses. 10.3 Airline Regulation and Deregulation. 10.5 Consumer and Producer Surplus, and the Net Gains from Trade. 10.6 Government Intervention in Markets: Quality Controls. 11.1 The Monopolist's Demand and Marginal Revenue Curves. 11.2 Profit-Maximizing Output of a Monopoly. 11.3 Further Implications of Monopoly Analysis. 11.4 The Measurement and Sources of Monopoly Power. 11.5 The Efficiency Effects of Monopoly. 11.6 Public Policy Toward Monopoly. 11.7 The Mathematic's Behind Monopoly. Chapter 12: Product Pricing with Monopoly Power. 12.2 Three Necessary Conditions fro Price Discrimination. 12.3 Price and Output Determination with Price Discrimination. 12.4 Intertemporal Price Discrimination and Peak-Load Pricing. 12.6 The Mathematics Behind Price Discrimination. Chapter 13: Monopolistic Competition and Oligopoly. 13.1 Price and Output under Monopolistic Competition. 13.2 Oligopoly and the Cournot Model. Chapter 14: Game Theory and the Economics of Information. 14.2 The Prisoner's Dilemma Game. 14.5 Adverse Selection and Moral Hazard. Chapter 15: Using Noncompetitive Market Models. 15.1 The Size of the Deadweight Loss of Monopoly. 15.2 Do Monopolies Suppress Inventions? 15.4 More on Game Theory: Iterated Dominance and Commitment. Chapter 16: Employment and Pricing of Inputs. 16.1 The Input Demand Curve of a Competitive Firm. 16.2 Industry and Market Demand Curves for an Input. 16.3 The Supply of Inputs. 16.4 Industry Determination of Price and Employment Inputs. 16.5 Input Price Determination in a Multi-Industry Market. 16.6 Input Demand and Employment by an Output Market Monopoly. 16.7 Monopsony in Input Markets. 16.8 The Calculus Behind Input Demand by Competitive and Monopoly Firms. Chapter 17: Wages, Rent, Interest, and Profit. 17.1 The Income-Leisure Choice of the Worker. 17.2 The Supply of Hours of Work. 17.3 The General Level of Wage Rates. 17.6 Monopoly Power in Input Markets: The Case of Unions. 17.7 Borrowing, Lending, and the Interest Rate. 17.8 Investment and the Marginal Productivity of Capital. 17.9 Saving, Investment, and the Interest Rate. 17.10 Why Interest Rates Differ. Chapter 18: Using Input Market Analysis. 18.2 Who Really Pays for Social Security? 18.3 The Hidden Cost of Social Security. 18.6 The Benefits and Costs of Immigration. Chapter 19: General Equilibrium Analysis and Economic Efficiency. 19.1 Partial and General Equilibrium Analysis Compared. 19.3 Conditions for Economic Efficiency. 19.5 The Production Possibility Frontier and Efficiency in Output. 19.6 Competitive Markets and Economic Efficiency. 19.7 The Causes of Economic Inefficiency. Chapter 20: Public Goods and Externalities. 20.1 What Are Public Goods? 20.2 Efficiency in the Provision of a Public Good. 20.4 Externalities and Property Rights. Edgar K. Browning is the Alfred F. Chalk Professor of Economics at Texas A&M University; his specialty is Public Economics. He earned a B.A. in Economics from the University of Virginia and a Ph.D. in Economics from Princeton University in 1971. A selected list of his publications include “ A Neglected Welfare Cost of Monopoly- and Most other Product Market Distortions,” Journal of Public Economics, 1997; The Non-Tax Wedge,” Journal of Public Economics, 1994; “The Marginal Cost of Redistribution,” Public Finance Quarterly, 1993; “On the Marginal Welfare Cost of Taxation,” American Economic Review, 1987; “The Trade-Off Between Equality and Efficiency,” Journal of Political Economy, 1984.